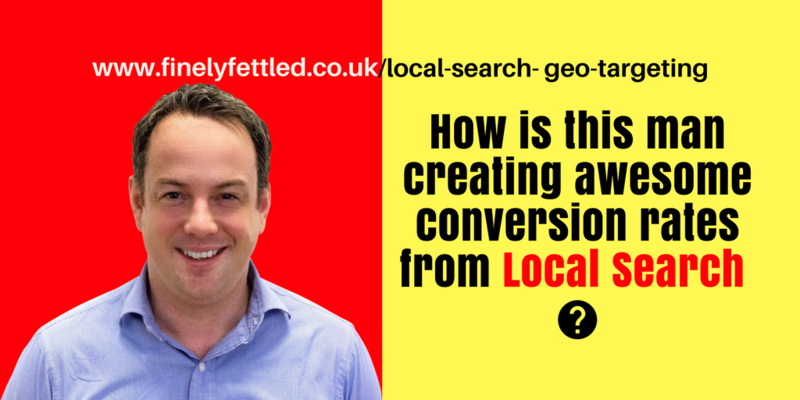 Local search geo-targeting expert Mark Taylor is the founder and Managing Director of eSales Hub Limited. Finely Fettled works with eSales Hub to introduce clients who want better lead generation results and see local search geo-targeting as the way forward. Geo-Targeting featured on The Next 100 Days Podcast. He was the 60th guest on The Next 100 Days Podcast. The podcast provides advice to small and midsize businesses to help them take actions within their business over a period of the next 100 days. The podcast is co-hosted by Graham Arrowsmith who works with eSales Hub as an introducer of new business. If you’d like to contact Graham about eSales Hub, email graham@esaleshub.co.uk or call 01535 654930. Mark Taylor started his marketing career with Hilton Hotels. They were an entrepreneurial international multi-site business. Hilton had a fantastic training scheme. Mark was despatched to the Lausanne Business School for a week to train Mark. Hilton made Mark. Eventually Mark decided to further his career at Swallow Hotels. He decided to work with a big brand so Mark left Swallow and worked with Virgin Active, another multi-site retailer. Eighteen months later he was approached to work in private equity. Mark realised that private equity really suited his skill set. In private equity, you buy a business, you trade it up as quickly as you can, to get revenues and profitability up and the you sell it. When Mark was involved with NAC, it was a chain of 217 garages that did MOT, service and mechanical repair. This was 7 years ago. Back then, he had noted that Yellow Pages was not working, despite spending £150,000 per annum on adverts there. They started to spend more and more on Google and they started to get a better return on Google. With just 14% of Nationwide Auto Centres coming from online, with the rest of their transactions came from offline, they invested in building booking engines for MOT, service and tyre-booking. What they found was that there were a lot of phone calls going into the garages directly – ‘can you repair my engine’, ‘can you repair my clutch’ – stuff that you couldn’t sell online because it wasn’t a commodity. Back to that sofa. Mark and his colleague Matt Robbins, his eBusiness Manager, discussed wouldn’t it be great to bridge that gap between what is an online sale and an offline sale. He asked himself ‘How much more revenue are we really driving from their ‘little’ website?’ Even though they were raising income from the site at NAC from £6m to £18m in about 12 months, Mark realised the geo-targeting opportunity was much bigger than that and there was a big chunk of it that they weren’t tracking because they were only measuring the online transactions they weren’t measuring the offline transactions. The NAC business was sold to Halfords and Mark worked there for 6 months. Halfords were quite surprised with NAC’s geo-targeting online capability. Halford were a traditional retailer. Go instore or buy online. A simple transaction. Mark’s second private equity transaction was with Esporta. They had a chain of 72 health clubs in the UK. In the end, Esporta was sold back to his ex-colleagues at Virgin Active. They had the same business problem. How do they generate leads on a local basis? When you have got a garage or a health club, back in the day ‘long tail keyword search’ would be thumbing through Yellow Pages. Get to the section you wanted. Look through the ads. Choose the one you wanted. And then you’d call it. This was the original local search geo-targeting strategy that almost every consumer and every business indulged in. What Mark was finding with online, is although we grew the sales mix from 2% online to 26% online within about 6 months, most their sales leads were being generated offline. They didn’t have the capability to know that online spend was influencing offline transactions. Mark realised the pattern this was drawing and became to see eSales Hub as a geo-targeting solution provider. He took his third private equity posting. With Evander Glazing and Locks. eSales Hub really began to shape here. If ever there was a business Locksmiths and Glazing that was based around Yellow Pages, it was Evander. 99% of their business was from insurance claims. They didn’t have a consumer proposition. Mark had little budget to drive leads online to drive locksmith and window glazing jobs. After a year though, he created a business segment that had a run rate of £2.9m with the rest of the business turning over £35m. Creating this reasonable sized business unit from a standing start, gave Mark the confidence that he didn’t need a brand behind him to create eSales Hub as a geo-targeting solution provider. 2nd April 2013 in Abi Dhabi, on leave, Mark decided to quit and start eSales Hub. His wife thought him crazy! Mark decided that with very small budgets he had created a reasonable business at Evander, with a totally online model. That gave him confidence to develop something that would bridge the gap that Yellow Pages used to operate in. A lot of the businesses that Mark now meets, used to 6-10 years ago get 30% of their business from Yellow Pages. But ever since the directories have lost the impact that they used to get, despite still working in some locations, but in the majority the internet has taken over. How can you provide the same level of business, if not higher, from the internet – when nowadays anyone with decent natural search ranking can monopolise that space? Yellow Pages was all about money. The bigger the ad you bought, the more leads you would generate. Mark sent his first site live in February 2014, a site called Go Locksmith. No-one thought his concept for eSales Hub would work, so he chose Go Locksmith as his first site to prove them wrong. He created the site and pointed it a Locksmith company in the south of England. From day 5, the site was generating leads which were converting at 40-50%! All for a company that didn’t have a consumer presence. They were more of a B2B company working for insurance companies, they just wanted a consumer channel. They just didn’t know how to do this cost effectively. The problem with Yellow Pages is you pay your one-off advertising fee and there is no guarantee that you get any return whatsoever. You may be investing £20-40,000 in your advert or you are investing £10-15,000 in your website. You have no guarantee that you are going to get a lead. eSales Hub realised what people wanted was NOT traffic, but conversions. That is at the core of the eSales Hub local search geo-targeting message. Clients only pay for what they deliver. So that’s how eSales Hub came about. What does eSales Hub do? There are 26 working parts of technology, some patent-pending that eSales Hub combines and uses to serve clients. Essentially you can boil this down to three broad areas. If you do a local search in Google and you search ‘Emergency Electrician Northampton’, Mr Electric was one of eSales Hub’s first geo-targeting clients. What you may notice is that there is no PPC (Pay Per Click) on there. Nonetheless, when you look at the map, of local carousel, Mr Electric is ranking first. 18 months ago, before Mr Electric connected eSales Hub technology to their site, that map presence was not ranking. When you look at people’s search habits – 10-20% will click on PPC. 40% will click on the maps. The rest is natural search. Part of eSales Hub’s geo-targeting technology tells Google that our client is a ‘local business’. This enhances your rankings, not only in maps, but also if you do the search terms ‘Emergency Electrician Northampton’, you’ll see Mr Electric comes up first and second on natural search. You’ll also notice that it has a bigger postcard presence on Google than any of the others. The postcard shows the review stars from Trust Pilot. eSales Hub knows from A/B Testing from having a bigger postcard, they can get a 27% uplift in click-through rate from natural search. That means, Mr Electric don’t have to be first or third, they can be fifth or sixth and still get the same traffic as second or third on a non-brand search term. The geo-targeting technology tells Google that the client is a local business. They do not have to have a local address in that areas for eSales Hub to be able to get the client to rank for local key terms, but they do need to provide their service to that area. If you search for ‘New Boiler Bootle’, GoHeatingRepair is eSales Hub’s website and it ranks first. It is pointed at Homeserve, the insurance company. The technology is telling Google that GoHeatingRepair or Homeserve ‘services’ that area. Click on the GoHeatingRepair link and it will take you to a local landing page. On there is a static telephone number. In this case, 0151 374 2187. That is eSales Hub’s tracking number where date, time, duration of call can be tracked, plus the call can be recorded. If you are thinking no-one makes phone calls nowadays, and that they all transact online. You’d be wrong. Google estimate that on mobile devices 70% of people will call as part of the transaction process. This statistic increase when you put location into the key term. That’s the power of geo-targeting. If you are searching for ‘Electrician’, you are less likely to make a phone call. If you search for ‘Electrician Northampton’ you’ve got a much higher propensity to call and make a booking for a service. Adding that location into your search term, you are increasing your intent to buy. eSales Hub primarily drives people through phone calls because they are higher converting. They are further down the purchase funnel. The technology allows you to track the keyword, if it comes through PPC. By tracking the keyword, eSales Hub puts data back into Google, to find what specific keyword was to drive that call. If you are thinking, what’s new, call tracking has been around for years. It has. But not using a static telephone number. eSales Hub knows from testing, that if you don’t use a static number for local search, and you use dynamic numbering, it kills your natural search. It will influence your local search rankings. By tracking down to keyword, but also the physical search term that the person has typed in and clicked on an advert, means that eSales Hub can optimise a campaign very effectively. Day 1, 95% of leads will come from PPC. Day 30, 50% of leads will come from PPC and 50% will come through natural search. That’s because eSales Hub is quickly getting clients natural search rankings too. For the client, these leads become very cost effective. For example, Mr Electric in the United States are paying $64 per lead, and each franchisee gets one lead per day. In the UK, it costs $10 per lead and they get four leads per day from eSales Hub. The service is about optimising and lowering lead price, but also about driving volume of leads. eSales Hub clients tend to convert between 50-70% of the phone calls they receive from this service! This kind of performance can have a significant impact on someone’s business, by driving them higher quality, better leads for a cheaper price that convert at that kind of level. Will this system work for a business looking for a smaller number of leads? Yes. Search is split into three categories. The ‘fat head’, ‘the mid body’ and ‘the long tail’. Fat head and mid body is 20% of search volumes. This is what the Google Keyword Planner looks at. The Google Keyword Planner is never accurate, despite what anybody says, because 25-29% of searches everyday are UNIQUE. Google has never seen them before. So, when you run the maths, how can the Google Keyword Planner be accurate, it can’t. eSales Hub has a client that works on the B2B side, in London, and they look after the Home Counties area, and they write bids. If you want to write bids for a local government contract, they are the guys to call. They are not the cheapest. It costs £8-9,000 for them to write your bid for you. But, they have a 92% success rate. Their search category gets 12,000 searches a month nationwide. eSales Hub only targets a 30 miles’ radius of London. This allows eSales Hub enough search volume for them to drive two leads per day for them. Out of those two leads they convert one, so of the back of working with eSales Hub, they have written about £250,000 worth of business in the last 12 months, off a very small amount of leads. They don’t need that many, and just want to go for the higher quality. It has had a significant impact on their business. What’s the one hook that Google puts all search onto? It’s your location. They are fanatical – rightly – about geo-targeting. When you scroll down to the bottom of any Google search, you’ll see right at the bottom they are trying to find WHERE you are accessing the internet. Google is trying to localise the search results to where you are searching from. But, Google don’t always get it right. Mark found this recently when he travelled from Doncaster to London to demonstrate the eSales Hub system. Google thought Mark was still in South Yorkshire, because Mark had accessed the internet in South Yorkshire, that morning. Google therefore presented results that were relevant to South Yorkshire and not London. But, generally, Google’s geo-targeting is getting a lot better. This conflating of two geographies appears to be a feature of how Google behaves in the rather crowded and localised UK. Contrast that with Germany. An eSales Hub client in Germany finds the geo-targeting far simpler. One reason for this is that post the Second World War, the UK was the only country that wasn’t rebuilt with American technology. The telecommunications infrastructure in Germany is an American system. It’s the same in France. Geo-targeting in other countries where they have more wider spaces between conurbations it is easier to do. Google’s geo-targeting was never really built for London, where you can have a 500-yard difference from the edge of one conurbation to another. What eSales Hub are finding is that people are responding to a local ad, which lands on a local page, with a local telephone number with a local service backup. Even in categories where you would not think there is local search. There is. The PPI industry (Payment Protection Insurance) is a good example of this. A new PPI client believed there wasn’t any local search for PPI. eSales Hub proved that there is and it can be very high converting and profitable. How well does the system convert? The average number of telephone conversions that eSales Hub geo-targeting clients are currently experiencing is 68%! Since eSales Hub are primarily targeting the telephone call, although ‘form fills’ are also generated, this focus on inbound calls filters out the tyre-kickers. They are calling the clients for a reason. That reason is they want to buy their service. Unless you struggle to sell on the telephone or don’t have that skillset, generally you will have a high conversion. A good example of this, is a conveyancing provider client. They built a very sophisticated quote engine, and generated lots of quotes. When they outbound called those quotes, a lot of people said they were ‘thinking of selling my house’ or ‘thinking of buying a house’. They were further back in the buying funnel. The calls that eSales Hub provide to them, tracked with call recording, are ‘I’ve just sold my house’, ‘I’ve just bought a property’. They are further down the buying funnel and therefore as they are live, speaking prospect on the phone, they are easier to convert than trying to outbound somebody. Unless you outbound a form fill in the 30 minutes from receiving it, you’ve probably lost that customer, because they’ve gone and found someone-else. eSales Hub finds with non-brand search, is they are going to the internet because they don’t know anybody and noone has been recommended to them. So, the first company they find that meets their buying criteria they’ll buy from. And if they get good service, they will repeat buying. These searchers are not brand loyal. Google makes it very easy to find another company. So, people will literally go down the list until they find someone they like the look of, meets their buying criteria and they buy. eSales Hub do this to sync into client’s finance systems. So not only can eSales Hub tell you what was the search term that lead to the call, but eSales Hub can see the search terms that drive the high value, higher converting or higher average invoice value sales. The reason why eSales Hub listens to the call, is sometimes that integration can take a little while to get reports. This might be once per week. However, as there is a call recording, eSales Hub knows instantly whether it is a good lead or a bad lead. eSales Hub employs a sales lady to listen to calls to provide feedback to clients. Generally, when clients go live, they are amazed that they get calls on the first day. The calls help clients hone their sales proposition. A lot of companies are used to outbound call scripts, but they are very different to receiving a call. For example, an asbestos testing company called bSure, on their first live day they had 5 leads and converted 3. They could have converted the other two, but there was just a little change in their script that they needed to make, to get that conversion. On their most recent day, they had 14 calls and they converted 11, just by eSales Hub feeding back to them a small tweak on their script. The geo-targeting data generated is not only about optimising your online presence, to generate more leads, but there is a lot of training data and examples that eSales Hub can provide based off the call recordings. Another reason to listen to the calls is to get feedback to make sure that eSales Hub have got the proposition right online. It is like running a direct mail campaign. Mark recalls having to send 100,000 mailers to get result. eSales Hub knows they need to be hitting at least 100,000 population on the internet, and how they have mapped the conurbations in the UK, Europe and the US, is on conurbations that Google recognises, so eSales Hub always starts with a number of locations to target needed to get a return. The way the landing page is laid out is to drive a response. A lot of clients have a website that is laid out like their advert in the Times. It does a good brand job and positions them well, but because eSales Hub gets paid on performance, on the leads sold, they take that website and amend it to make it a more direct responsive site. That’s what eSales Hub gets paid to do. This means eSales Hub can drive 20-30% more volume that is complementary to the client’s national strategy because it is a direct response model, like a direct mail piece, rather than an advert in the Times that is focused on brand building. Is the ideal audience for eSales Hub those companies less-focused on brand? Absolutely. Experience is that it is number 2 or 3 in the market who are willing to invest to get that number one position. The eSales Hub ‘why’ statement includes a desire only to attract companies with a genuine desire for growth. Growth in any business comes from new business. That’s the hardest thing to generate sales from. The easiest thing is to get repeat purchase from existing customers, because they have already experienced your service. If a customer has gaps in their handling of telephone calls, the eSales Hub system will find the straight away. So that desire required is their willingness to fix their scripts and work with eSales Hub to get the most out of it. Once that phone rings, success is very dependent on how those calls are received as to the result the client is going to get. It has to be a partnership approach. A good example of this partnership approach is Mr Electric. eSales Hub have helped them grow their average invoice value from £75 in the UK to over £500. This has not been easy to do. It wasn’t a flick of a switch. The effort was in understanding the keywords that worked, understand the keywords that worked on PPC versus SEO, and which areas work. Similarly, with drains, in Scotland they call that a clogged drain, in England they call it a blocked drain. But then you have Corby, a town which attracted a lot of Scottish people a few decades ago because of the Steel works. So, you must amend your strategy to consider regional variances. If you ignore the detail you would miss huge opportunities for success on a local level. Mr Electric’s site has a video on their site with Mike Ryland, the South West London Franchisee. Mike’s story was he’d lost a B2B client worth 80% of his turnover. eSales Hub worked with Mike to help him recover the situation. The eSales Hub system has algorithms that spots patterns. Once a positive outcome is discovered, eSales Hub goes after it. Experience suggests that different keywords behave in a different way. For example, anything with ‘boiler price’ in it has a much higher conversion and average invoice value than keywords with ‘boiler cost’. That is reflective of people’s position in the market. If you are searching with ‘price’ you are probably more likely to buy, whereas ‘cost’ probably reflects that you are still doing your research to find out what the cost is. There are certain regional areas which work differently for different products. The great thing about having a geo-targeting strategy is rather than blanket covering the whole of the UK, you can pick the pockets of those conurbations that you really want and can service. Whilst some of eSales Hub’s client might appear to be national, only cover 60% of the population. So, the eSales Hub geo-targeting strategy enables them to do is only get leads and business where they want to. Especially if you are running a man and van business where that is quite important, because the more time you are spending driving to customers the less time you are earning revenue. Even for non-service based companies eSales Hub supports, like a claims management company, a geo-targeting strategy enables the targeting of areas which are known to be higher converting or have a higher propensity to buy that specific product or service. Are you picking the pockets of your best conurbations? The problem with using above the line media and expecting a response, is that you should pray that your buyers are reading the paper at the time you put the advert in. Whereas, search has flicked everything on its head. You are only targeting those people who are actively looking for your product. By adding the dimension of ‘conurbation’ and location and geo-targeting to those people who want your service, you can get very finite in your geo-targeting to only target those leads that will convert. That’s why eSales Hub have a spectacularly high conversion rate. The task is to look for the 10 to 20 people a day who are going to convert, not trying to target 100,000 through the readership of a magazine or print media. eSales Hub conduct keyword tracking on paid media only. The reason is Google switched off natural search data some time ago. The probably reason for their move to do this, was a lot of people were trying to spoof Google natural search. So, if you find out that you are getting lots of traffic from a natural search term, you would do your best to rank. And that is what causes spoofing. Whereas, with paid search, you have to be paying money to be there. You are more likely to be a brand or reputable company. It costs to be involved. The reason why eSales Hub focuses on Pay Per Click advertising is to help companies. For so many of those companies, PPC is their most expensive form of marketing. They feel they have to do it because all their competitors are doing it and if they don’t do it they will lose market share. Another reason why eSales Hub give a good return for clients for their Google Adwords campaigns. As this was where a lot of their expense was going. The eSales Hub geo-targeting optimisation tool picks up differences between Google Analytics and Adwords, with the former not picking up everything from Adwords. The Adwords interface appears to be a lot more reliable. The tool identifies the keyword and search terms from Google Adwords and the calls or form fills that come from natural search – the tool cannot tell you what the keyword that drove a natural search call is, because no-one knows that data. Instead, eSales Hub understands the mix between PPC and natural search to optimise PPC to avoid wasting money and not spending money on clicks that don’t simply convert. Customers will rarely put their hands up to spend a lot of money on PPC. But, eSales Hub knows that certain search terms behave differently between PPC and natural search in certain categories of the business. Especially so with mobile. There are no more ads above the natural search ads than there has ever been. Google has even changed the logo for the ad from a dark colour to a light colour, so it becomes difficult to know what is paid for and what is natural search. Google make money from paid, not natural search, so it is in their interests to get customers to spend more on paid search. The trick is to generate business cost effectively. Those that aren’t doing anything that need to do something but are on a budget. Those that are doing something, but it’s not costs effective, so they need to optimise it to a greater level. Those that are doing something already and see this as another source of business, because targeting local search is not easy to do, it is quite complex, detailed and you need the right tool for the job. How can clients make a start on geo-targeting, without eSales Hub? Firstly, make a start by having a good representation on Google My Business. Regualrly update this with pictures, with reviews. Just by having a map presence, 40% of clicks will start to see you as a business. It is free to do this. Local search is only going to get bigger. Why? Google is all about relevancy. The first search results were very generic. ‘Locksmith’ would produce a ranking for National Locksmith Association would be second plus a load of national companies. At home in Doncaster, the search ‘Locksmith’, the National Locksmith Association is number one, but two, three, four and five are all local companies. Google want to make the search experience much more relevant to you the user and they want you to stay within the search engine as much as you can. This explains the hotel API they have recently brought out, where you can check availability and price within the search engine. Also, within PPC, you can present your prices as additional postcards. That functionality wasn’t available 6 months ago. Therefore, making the search results more and more specific to where you are, let alone what you are searching, is really the Google strategy moving forward. It is all about user experience. People fall foul of their algorithms by not having a good user experience on page. They’d like the results to be way more relevant, way more useful and to maintain their trusted status as a brand. So, whoever comes up in a search second third and fourth, you should believe they are relevant and trustworthy. If people are trying to spoof that, it questions your trust. Trust is so critical to their Google brand, that is why it is understandable that Google would go down the path of making a search way more specific to you based on what you have searched from. Therefore, you should be optimised for that. You should get ready for that. The second thing is make sure you have a phone number on your website. Vodafone, a telecoms company, it is difficult to find their telephone number. Not every circumstance will you answer my questions online. They don’t seem to care. Their phone is buried on their site. They don’t want you to call them. Most customers will want to call you. Does the phone number need to be a local number? eSales Hub believes it does. When eSales Hub was first set up, tests were done on 0800, 0345 and various numbers. Having the local number backed up the fact that you were a local business. eSales Hub worked closely with the Advertising Standards Authority and Trading Standards to avoid spoofing the results. Few companies are nationwide. There are over 1,000 conurbations in the UK. Now, eSales Hub doesn’t have a single client over 270 conurbations. When you look at it, not everyone covers the whole of the UK. The approach taken is to only promote to an area where they genuinely offer that service. Would a landing page rather than a regular website be best for targeting sales leads? eSales Hub picks up on the brand guidelines of each client it works with. The pages are written in a different way. That’s because 25% of searches are now voice. If you write copy in the written form, not the spoken form, you will struggle long term with voice activated search. How someone types and speaks a search is different. It is a trend eSales Hub spotted about 8-9 months ago when these new toys from Amazon and Google hit the market, which are voice activated and do voice search. So, having the right text on the page, having the right relevancy does make a massive difference. eSales Hub likens itself to the marginal gains team of the Sky Cycling Team. If you do a couple of these things in isolation, they won’t have that big an impact. If you pull these 25-30 things together that eSales Hub does to drive things locally – that’s where you get your biggest bang for your buck!